Based on Lorraine Hansberry’s 1959 play of the same name, David Petrie’s A Raisin in the Sun is at once a searing, affirming and defiant portrayal of race, poverty and frustrated aspiration in America. Headlined with a barnstorming performance from Sidney Poitier, his beleaguered family man is a far cry from the quiet dignity of his other key roles. Comprised of a tiny kitchen / living area, two bedrooms and a bathroom shared with the rest of the building, the Younger family’s apartment houses Walter Lee (Poitier), his wife Ruth (Ruby Dee), their son Travis (Steven Perry), his sister Beneatha (Diana Sands), and finally his mother, Lena (Claudia McNeil). Living on top of each other with Travis sleeping on the living room couch, each yearns to escape their limited means. Walter dreams of leaving his job as a chauffeur and opening his own liquor store with the insurance money left by his late father, while college girl Beneatha is training to be a doctor while trying to reconnect with her African roots. Meanwhile, Ruth is simply trying to keep her family from falling apart while breaking her back working as a laundry woman, and bustling, well-meaning Lena can’t help meddling. Hansberry brilliantly adapts her source text for the screen, capturing the boiling-point tension simmering between the family members, and aside from a few extraneous but brief scenes, contains the drama within the four walls of the Younger family’s apartment. 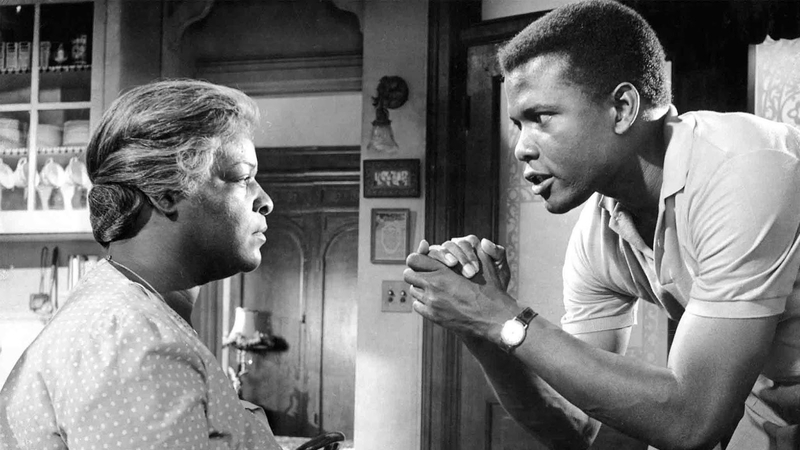 If A Raisin in the Sun’s theatrical origins are apparent, they never feel less than cinematic in the able hands of cinematographer Charles Lawton Jr., whose black and white photography transforms the Younger’s drear living quarters into an unstable psychological space, ready to crack apart at any moment. The Chicago summer’s heat is palpable in the pressure cooker of the apartment, sweat dripping from Poitier’s increasingly furrowed brow, the interior location offering no respite from the hot cruelty of the outside world. But while the environment exerts its maddening influence, it’s the family itself where Petrie’s film discovers its humanity. Each character is tragically flawed – Walter Lee’s legitimate anger with his meagre lot bubbles over into violent outbursts, while he routinely undermines Ruth in front of their son while dreaming up a cockamamie get-rich-quick scheme that can only end badly. Meanwhile, Beneatha’s sense black pride is timely, but her sudden insistence on wearing traditional African dress is naive and affected. Finally, Lena is a proud woman and within living memory of Jim Crow laws and even slavery, but living in the past blinds her to the dreams of her children. Ultimately, what binds each of the characters is their drive for dignity – what divides them is their blindness to each other’s in favour of their own. The film’s bittersweet, uncompromising finale may not magically grant them all they desire but it does offer a chance at the emancipation of dignity.